The Trash To Tunes show is a performance using handmade and homemade musical instruments inspired from instruments around the world. Interesting sights, sounds, and stories about the instruments give audiences new insight into folklore, music, craft, science and world view. Appropriate for schools, libraries, recycling and environmental organizations and other public venue. Video sample from the DVD From Trash To Tunes, a performance at the East Hampton, Connecticut community library. Music Around the World is a one hour tour through the music of six different world cultures. Designed for small audiences, this program emphasizes group interaction and participation. Musical instruments, each unique to the culture represented, are demonstrated and discussed in regard to points of history, social studies, science and art. Participants will engage in song and instrument play usual to the musical expression of six different culture areas. Video – Dennis Waring at a community family night dinner and performance with small groups of volunteer youngsters performing music snippets from Cuba, Africa, India and China. Dennis Waring brings a wealth of expertise and talent to the concert stage. His imaginative approach to performing world music is entertaining and informative. Waring presents concerts for schools, libraries, museums, coffeehouses, and for recreational and community organizations. His innovative shows are based on current trends in music and extensive experience working with people of all ages in academic and recreational contexts. Dennis Waring is also a member of the musical group Sirius Coyote where he plays flute, clarinet, saxophones, and many other instruments. Sirius Coyote is a multi-talented group of musicians, storytellers and instrument makers. They perform on over 30 different ancient and modern instruments of the Americas, hand crafted by the artists themselves. Their concerts and workshops have delighted audiences from New England to Mexico for over 30 years. Video: Three songs from a Sirius Coyote trio performance for regional schools. The Vibrant Ensemble is comprised of percussionist/gong master Stephan Brandstatter and multi-instrumentalist/ethnomusicologist Dennis Waring. Performances are comprised of improvised compositions played “in the moment” on a wide assortment of instruments. The mood is calming, ethereally soothing and evocative. 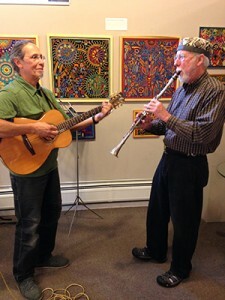 Dennis plays saxophones, clarinet, and a variety of flutes and ocarinas. 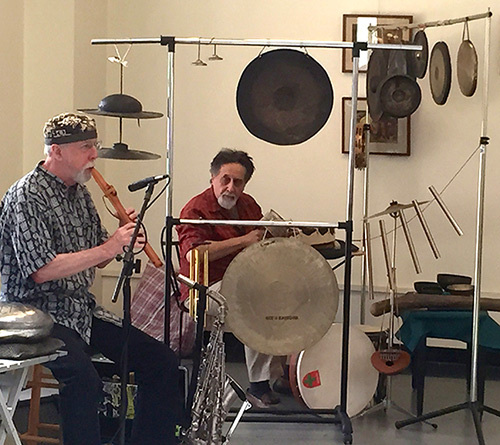 Stephan plays an array of gongs, chimes, Tibetan bowls, frame drum, dumbek and more. Based on world music inspirations, soundscapes incorporate the sounds of nature, the exoticism of the East, and the pulsations of Africa and Latin America. 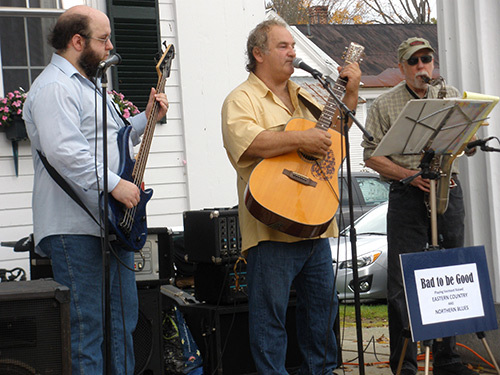 The music of Bad To Be Good is characterized as “Eastern Country and Northern Blues.” Led by songwriter, guitarist and vocalist Marvin Bentley, the all original repertoire of this group establishes Vermont country blues as a rival to Nashville and Memphis. With Marvin’s robust and burly voice, Dennis Waring’s wailing saxophone, Marvin Bentley II’s thumping bass and Pat Kelly’s grooving drums, this group’s infectious spirit makes you want to shout and dance. Other songs make you want to cry. This band defines a whole new style of Vermont-grown down-home music with lots of soul.